There is nothing like spending a day on the water in Puerto Vallarta. The sun shimmers off the glass-like water as the humpbacks leap and curious dolphins come to see who's there. A great way to enjoy the many attractions of the bay without the crowds or a set itinerary is to charter (rent) your own boat. Sound expensive? Not with us! We offer you 4, 6, 8, or 10 hour private charters that can take you to the popular snorkeling destination, Los Arcos, the popular beaches of Las Animas or Yelapa where you can lounge on the beach, parasail, ride a banana boat, go on a horseback ride, or whatever else you want to do (beach activities are available at extra cost). You can also just bob around the bay and do some snorkeling, drinking, whale watching, or just hanging out! We'll even provide the snorkeling equipment! Our excellent boats are shown below. Their pages are written for fishing, but all boats are also open for snorkeling, beach hopping or whatever you like. Just write your request in the special instructions box when booking. For larger groups, see our Yacht Charters or Request a Quote. Duration: 4-12 hours, depending on trip. Includes: Private Boat (You Choose the Boat), Expert English-Speaking Crew, Cooler of Ice, Bottled Water, Fishing License, snorkeling equipment. Departs From: The marina in Puerto Vallarta. 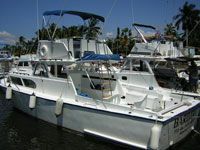 Most boats also have pickup options from Nuevo Vallarta. Choose Your Private Boat for a Day! This is a great idea for an excursion. 4 or 6 hour charters are perfect for you, as they can be requested to fit any schedule. Our marina is only 5 minutes from the Cruise Ship port.